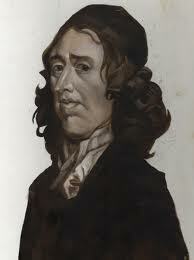 Here's a good word from John Owen, with which I sign off from the blog for the next week. Back Monday, June 6. What am I the better if I can dispute that Christ is God, but have no sense of sweetness in my heart from hence that he is a God in covenant with my soul? What will it avail me to evince, by testimonies and arguments, that he hath made satisfaction for sin, if through my unbelief, the wrath of God abideth on me, and I have no experience of my own being made the righteousness of God in him--if I find not, in my standing with God, the excellency of having my sins imputed to him and his righteousness imputed to me? Will it be any advantage to me to profess and dispute that God works the conversion of a sinner by the irresistible grace of his Spirit, if I was never acquainted experimentally with the deadness and utter impotency to good, that opposition to the law of God, which is in my own soul by nature, with the efficacy of the exceeding greatness of the power of God in quickening, enlightening, and bringing forth the fruits of obedience in me? It is the power of truth in the heart alone that will make us cleave unto it indeed in an hour of temptation. 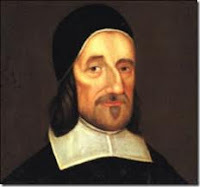 Let us, then, not think that we are anything the better for our conviction of the truths of the great doctrines of the gospel, for which we contend with these men, unless we find the power of the truths abiding in our own hearts, and have a continual experience of their necessity and excellency in our standing before God and our communion with him. All that is said about the significance of the work of Christ presupposes that he includes in himself the whole people of God, or redeemed humanity. His death and resurrection are not to be understood if they are thought of as no more than the death and miraculous resuscitation of an individual, but only if they are seen as the fulfillment of the whole purpose of God to raise up for himself, through suffering, tribulation, and disaster, a people made wholly one in him and devoted to his righteous purpose. Christ 'rose the third day,' says the ancient formula quoted by Paul in his first epistle to the Corinthians, 'according to the scriptures.' But in the Scriptures--videlicet, in Hosea 6:1-3--it is Israel whom God will raise on the third day. The bold application of that prophecy to the resurrection of Christ in the earliest Christian confession of faith known to us lies behind the Pauline doctrine of the church as dead and risen in Christ. 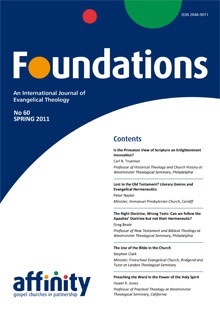 Foundations, a British journal published twice yearly that focuses on evangelical theology, and overseen by great guys like Martin Downes, Garry Williams, Pete Williams, Iain Campbell, and others, recently transitioned into an online format. The spring 2011 issue deals with the Bible and hermeneutics and includes essays by Carl Trueman and Greg Beale. But if we cultivate humility by looking at something other than humility, what do we look at? If humility 'is a relation,' as Cherry rightly says, what is it a relation to? Well, yes. But what about him? His greatness, you might say. His infinitude. He is vastly above us, resplendent in glory and might. Awareness of his greatness and my littleness, then, generates humility. 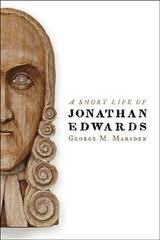 Jonathan Edwards would disagree. He would say: Yes, that's true as far as it goes, but you still haven't gotten to the core. It is not an inward sense of God's greatness that generates humility; it is an inward sense of God's loveliness, against a backdrop of his greatness. Here's a nice app from our friends at RTS that helps you memorize the Westminster Shorter Catechism--one of the most outstanding summaries of Bible doctrine ever written--in 90 days. 1. The Westminster Confession of Faith - a topically arranged statement of Reformed doctrine in 33 chapters, with 5 or 6 explanatory paragraphs in each chapter, accompanied by meticulous Scripture proofs. 2. The Westminster Larger Catechism - the doctrine of the Confession of Faith put in question and answer form for the purpose of catechesis. This is the document that famously begins 'What is the chief end of man? Man's chief end is to glorify God and enjoy him forever.' And so on. An interview with Lig Duncan and Bill Barcley on the New Perspective on Paul, on which Lig and Bill have written. On one of his seven trips from Britain to America, George Whitefield was battling depression and feelings of failure and was stabilized finally only with meditation on God's love in Jesus Christ. Nothing could possibly support my soul under the many agonies which oppressed me when on board, but a consideration of the freeness, eternity and unchangeableness of God's love to me. I need not fear the sight of sin when I have a perfect, everlasting righteousness wrought out for me by . . . Jesus Christ. The riches of His free grace cause me daily to triumph over all the temptations of the wicked one. . . .
May he enlighten me more and more to know and feel the mystery of his electing, soul-transforming love. Nothing like that, to support us under present and all the various future trials. . . . But the Lord has apprehended us and will not let us go. Men and devils may do their worst; our Jesus will allow nothing to pluck us out of His Almighty hands. Looking forward to thinking about and praying for revival with Bob Smart and Joab Rico and others in a few weeks in Gainesville, Georgia. If anyone is in that area, we would love to invite you to join us. In your youthful over-estimation of yourself, never make a hasty decision until, after extensive and precise research, you are capable of making a good judgment. In everything, hold tenaciously to your faith and to the holy ideal that brought you here. If God is for us we have nothing to fear. Is the Bible Sharper than a Two-Edged Sword? Maybe so, but that's not what Hebrews 4:12 means, despite the number of times we've all heard someone refer to the Bible as 'living and active, sharper than any two-edged sword, piercing to the division of soul and of spirit,' and so on. The 'word' of God in Hebrews 4:12 is logos, a flexible Greek word which does at times (not often) refer to written Scripture (e.g., 2 Tim. 2:15?). But if we are sensitive to the context we notice that logos has already been used a bit earlier, in Hebrews 4:2--'For good news came to us [lit. 'we have been good-news'ed] just as to them, but the message [logos] they heard did not benefit them . . .' The ESV rightly interprets logos here as something spoken (not something written), a 'message,' in accord with its connection with the verb euangelizomai, 'to speak the gospel/good news,' which occurs again in Heb. 4:6. The word of God that is living and active and all the rest is the gospel. This is not mutually exclusive with written Scripture, of course. The two, gospel and Bible, overlap in all kinds of ways. But they are distinct, and one is being denoted in Hebrews 4 and the other is not. I think Hebrews 4:12 is really getting at the same core idea expressed in Jesus' quote of Isaiah 6 in Matthew 13 to the effect that God's revealed truth does not leave people where they were: it either further hardens them or opens their eyes. To some the gospel is the aroma of life, to others the aroma of death (2 Cor. 2:15-17; again the logos of God, v. 17). Which is precisely what is meant in the context of Hebrews 4--the good news of promised rest for God's people landed on some to their hardening and on others to their rejoicing. The gospel, joyfully heralded in all its truth and starkness, is a piercing message that penetrates as no other message does or can, either reinforcing our natural recalcitrance or igniting fresh freedom. The gospel is the truest, most incisive diagnostic, a spiritual x-ray, a light shining way down deep into the darkest recesses of the heart. Hearing it either further enslaves or further liberates. It does not leave us as we were. I know that experiencing His love doesn't take away the pain, but it does mute what in my opinion is the worst thing about pain, the feeling of judgment and sting that attends it. If in the moments of deepest pain I know that God truly regards me as a tender Father regards his lost-long son or daughter, there is a brightness and hope that carries me along in the midst of that pain. I can't help feeling that that hope is so real, so joyful, so resurrection-quality, that it almost numbs the pain. '. . . the worst thing about pain, the feeling of judgment and sting that attends it.' Yes. What Is the Book of Daniel Centrally About? The central truth which Daniel taught Nebuchadnezzar in chapters 2 and 4, and of which he reminded Belshazzar in chapter 5 (vv. 18-23), and which Nebuchadnezzar acknowledged in chapter 4 (vv. 34-37), and which Darius confessed in chapter 6 (vv. 25-27), and which was the basis of Daniel's prayers in chapters 2 and 9, and of his confidence in defying authority in chapters 1 and 6, and of his friends' confidence in defying authority in chapter 3, and which formed the staple substance of all the disclosures which God made to Daniel in chapters 2, 4, 7, 8, 10, and 11-12, is the truth that 'the most High rules in the kingdom of men' (4:25; cf. 5:21). He knows, and foreknows, all things, and His foreknowledge is foreordination; He, therefore, will have the last word, both in world history and in the destiny of every man; His kingdom and righteousness will triumph in the end, for neither men nor angels shall be able to thwart Him. A word for Sunday School teachers, small group leaders, preachers, hospital chaplains. It is not impossible for 'holy reverence' to co-exist with humor. But it is hard. Note: by 'levity' Baxter does not mean joy. Laughter is often the substitute for, not the manifestation of, joy. 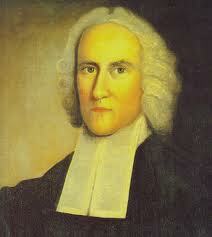 Perhaps it is fitting that he lived through the Great Awakening but missed the American Revolution. History remembers the revolution as more significant than the awakening. Last year my dad started a creative new ministry initiative, the Immanuel Theology Group, at Immanuel Church (A29) in Nashville. 2010-2011 focused on missional leadership and guys like Sam Storms, Scott Thomas, and Bruce Ware helped us think through in theologically rich ways what it means to live on mission. This year the ITG will focus on the Bible. I'm stoked. Immanuel Church will welcome Bruce Waltke, Doug Moo, Bob Yarbrough and others to unpack parts of Scripture they've spent a lifetime studying. Each seminar goes all day one Saturday a month, August through March. Total cost is $1,000 to cover expenses. The brothers who participated last year were focused on Christ and intent on learning in a relaxed-but-serious atmosphere that was spiritually combustible. It was a unique and meaningful time for all of us involved. It requires no time off work, strengthens both mind and heart, and plunks you into the midst of a band of brothers who hate sin, love the Savior, and want their lives to count. If you're within striking distance of Nashville, consider joining us. If you can't join us physically, join us in asking the Lord's blessing over this. A cold, hard-hearted Christian is the greatest absurdity and contradiction. It is as if one should speak of dark brightness, or a false truth! What is the final, permanent state of God's people? We tend to think of our future as Christians in terms of 'heaven,' by which we generally picture a disembodied, ghost-like, shadowy existence that is nice but boring. We think of this present life as our only chance to enjoy peach cobbler, a beautiful sunset, a game of basketball with the kids in the driveway, giving a friend a non-awkward hug, sleeping in, skiing, the beach, backrubs, the smell of a rose, and Pachelbel’s Canon in D.
We think: this world is our only shot at any joys that are experienced as embodied creatures. The next life will only be spiritual/disembodied pleasures, so this is our one shot at physically mediated joys. Now it is true that our temporary state as believers will be a disembodied one, in the presence of the Lord, which is better by far (Phil 1). But this is an interim, less-than-ideal, not-the-ultimate-goal kind of existence. It will only last until Christ's second coming. The final goal, the permanent state, is Eden restored, or new creation. The immediate, temporary future after death is disembodied. The ultimate, permanent future is embodied. The final state is not the popular notion of heaven but the new heavens and the new earth--by which the biblical writers mean, this earth, restored. We tend to think God created the world in Genesis 1–2, we screwed it up in Genesis 3, and God is tolerating the whole thing till one day when he scraps it all and brings us to heaven, leaving earth behind like a one-way space shuttle. But the Bible--especially the final chapters of Isaiah and the final chapters of Revelation--describes our final destination as a restoration of creation. Creation regained, as Al Wolters puts it, and as our Dutch friends have been saying for so long. Taking us back to Genesis 1–2, only this time even better than the first time around. This is the great hope of the prophets, picked up in a myriad of ways both explicitly and implicitly by the NT writers. (Note also Ben Merkle's article in WTJ last year rightly arguing that the ones 'left behind' in Matt 24 and Luke 17 are the believers, not the unbelievers). All three portray an embodied, physical humanity enjoying life on earth. Would we not expect our own future, likewise untainted by sin, to continue this trajectory? The supreme joy of the new earth will be the exquisite delights of perfectly restored fellowship with the Triune God, the one for whom our souls were made. And this supreme joy will be mediated through bodies. The chief and fundamental thing in the Gospel is this, that before you take Christ as your example, you recognize and accept Him as God's gift to you; so that when you see or hear Him in any of His work of suffering, you do not doubt but believe that He, Christ Himself, with such work or suffering of His, is most truly your very own, whereon you may rely as confidently as if you had done that work. . . . See, this is to understand aright the Gospel, that is, the infinite grace of God. . . . This is the mighty fire of God's love toward us whereby He makes the conscience confident, joyful, and content. I was moved in reading a 1994 CT essay in which Nathan Hatch, president of Wake Forest, reflected on his dad's life as an expression of 2 Corinthians 12:10. Nathan's brother Jim works with church planters in the PCA and has been kind to me many times. It is unnerving to say that the most godly person I have ever known is my father, James "Buck" Hatch, who turns 80 this year—unnerving because he has never been a tower of strength. Those of us who have known him best saw his weaknesses as clearly as his strengths. Grace amid weakness is, I suppose, the theme of this birthday tribute, for it was through his brokenness, not his strength, that he brought healing attention to the shadowed interior rooms of people's lives. 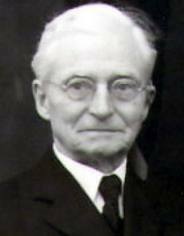 His life has much to say about the nature of Christian ministry. A painfully shy person, always near the brink of depression, Buck has experienced life more as a vale of tears than as a vista of opportunities. I often remember Dad coming to dinner—a boisterous affair with four sons—and just sitting at the table, not uttering a word. Here's the rest of the essay. If all our conduct, both open and secret, should be known, and our hearts laid open to the world, how should we be even ready to fly from the light of the sun, and hide ourselves from the view of mankind! And what great allowances would it be found that we should need, that others should make for us--perhaps much greater than we are willing to make for others. Can't resist posting this again. The conversation of the final seven minutes is worth consideration by every Christian. I continue to learn so much from James. (Example: his statement to young men about going into full-time ministry that 'God isn't calling you full-time until he needs full-time what you're already doing part-time' is gold, and something I'll take with me for a long time.) And he led this conversation wisely and charitably. Yet he seems to assume here--mistakenly, to my mind--that the weight of one's sin, and one's self-perception of that sin, is quantifiable by a list. Anyhow, the interchange of the final thirty seconds is just priceless. Amen, C.J. An interview at CT with Jerry Root, who co-authored with Stan Guthrie this book, just released last month from Moody. This looks like a fascinating collection of Civil War stuff at Wheaton College, on the third floor of the Billy Graham Center. On display through this July.